With the explosion of Spring I have been trying to lighten things up. I can’t make any major changes while our house is on the market but I have been bringing in some fun accessories. This cloche was made a while ago but it has been stored away just waiting for warm weather. I made the display using bits and pieces I had left from other projects. The only new thing I bought was a small 99 cent grapevine that I made the nest with. The cloche and cake stand I already owned and both were purchased at Goodwill for just a few dollars. room to add a touch of outdoors. See the cute pillow? The pillow was a gift from my newest sponsors. Sisters Shannon and Julie are the talent behind these fabulous pillow covers. where they not only sell these wonderful pillows but also some vintage items and jewelry. I chose this pillow because the colors work perfectly in our family room. Love it with our Italian lamp. Here is a little info on the sisters taken from their profile and some of the products they sell on Etsy. do and enjoying every moment of it. Besides Etsy we take our show on the road twice a year to the Country Living Fairs in Columbus, Ohio and Atlanta, Georgia. Check out our blogspot Gatheredcomfortsblogspot.com to keep up with what we have been up to. Wouldn’t this pillow make a wonderful Mothers Day gift? Please stop by and say hello to these sweet shop owners. 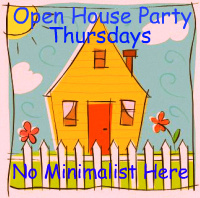 seasonal changes at my Open House Party each Thursday. I will definitely visit the sisters' etsy, Sherry! Thanks for the introduction ~ that pillow is just wonderful! I understand what you are dealing with since I'm on the market, too. I'm trying to keep my projects limited to smaller things that don't impact the house itself. Your cloche is really lovely and I am relying on things like this for that Springtime feel, since it is still kind of cold here. Love the cloche and those pillows are gorgeous! 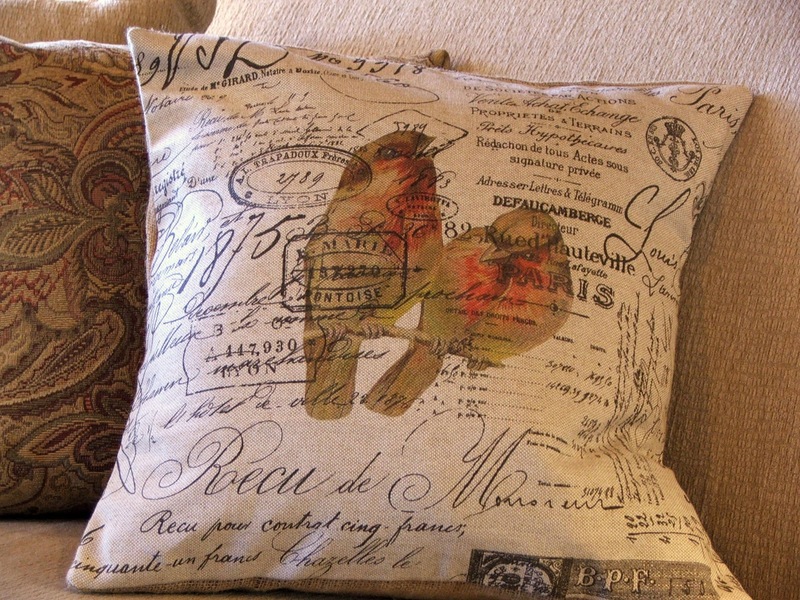 Sherry the pillows are wonderful & your cloche creation is fabulous. You know I love the pillows as I shared some of my obsessions. I knew I liked you…thanks so much for stopping by. I appreciate you spreading the love on Market Yourself Monday! Oh my…love your cloche and the pillows are sooo awesome…these ladies do a great job with them…I'm going by and check them out. 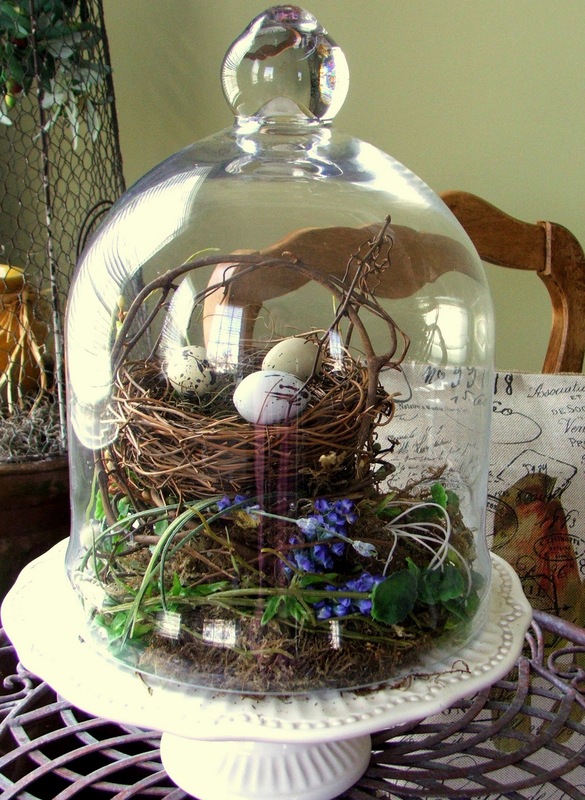 Sherry, I love your cloche and your nest is so real looking. Great pillows and I have such a weakness for pillows. I will check them out. Thanks for introducing a new blogger and etsy shop. I'll go over and say hello. I'm in love with your cloche, bird's nest and little table. It all makes a pretty vingette. I have a couple of cloches that I have nest under too! Love those pillows. I am off to check them out. I am such a bird fanatic that you drew me in with those first two pics buty each one was just as beautiful..the pillows…WOW! Wow! Your blog is lovely! I need to take time to look around more. And the etsy store is great. Beautiful pillows. OMG! Those are the most gorgeous pillows!! I love the birds! The cloche is very pretty and such a great idea. Sherry, I love your cloche! And I love all of those pillows! 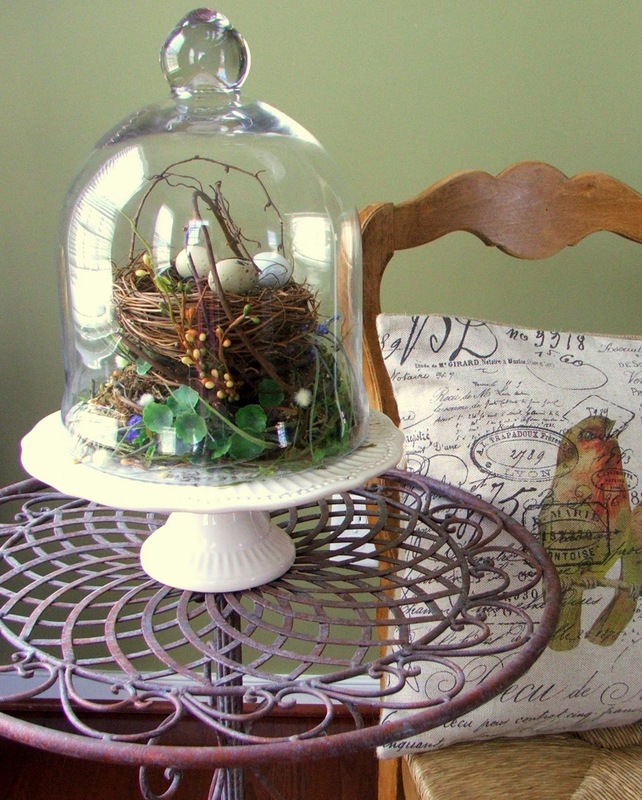 Sherry, I love your spring cloche with the bird nest inside! Those pillows are so beautiful and unique! Love that pillow Sherry and your cloche looks very springy and beautiful! Lovely! Your posts are always so lovely and inspiring. Lovely post! I will check out the etsy shop! Thanks! such pretty pillows! Love your style! I'd love it if you'd come by our Wicked Awesome Wednesday blog party this week if you get a chance. Sherry, I can't believe you got that gorgeous cloche at GW! And it looks so pretty and ready for spring! I would love any of those gorgeous pillows. How beautiful! Everything is looking so pretty and ready for Spring. 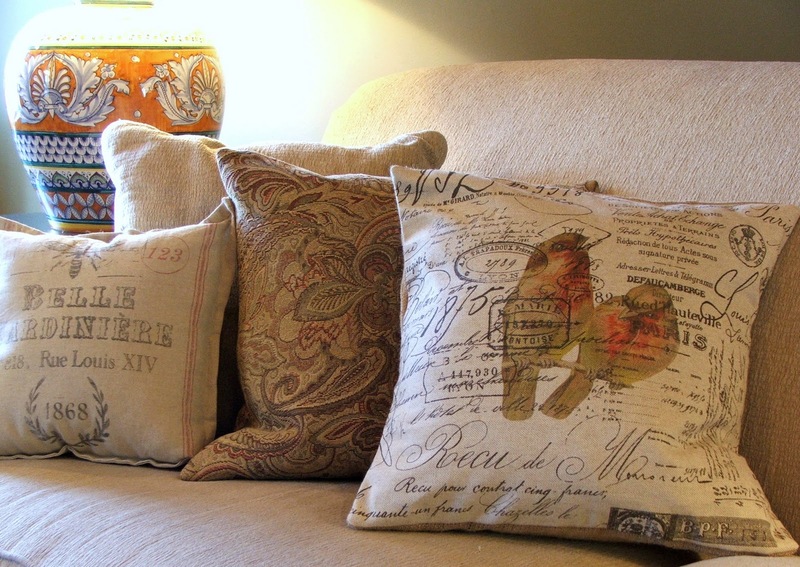 I really love your pillows!~ The pattern with the birds is so pretty. Your spring cloche is beautiful, Sherry. I particularly like the tiny purple flowers near the bottom- they look great with your green walls and the green leaves. Sherry, the pillows are just gorgeous and so varied too. I love the bird prints over the lettering. What talent. Your gorgeous cloche makes me yearn for warm days. Not here yet! What a pretty cloche and lovely pillows. I'm currently looking for just the right cloche and hope to blog about it when I get it. Those pillows are beyond adorable! Oh, I love them! Beautiful cloche display. Doesn't get much springier than that! And I am seriously in love with your pillow. I checked out their etsy site before leaving this comment. They have beautiful stuff. I love all your pieces and your house is amazing too! I want one of everything for my house! I'm a new follower from the Homemaker on a Dime Party & Hop. I'd love for you to stop by. Hi Sherry, Just love your spring cloche and all of those beautiful pillows. Gorgeous, love the pillows! Thanks for linking up to Beyond The Picket Fence.